Both Olympus TG-4 and Fujifilm XP90 are digital cameras with environmental sealing, which means that these models are feasible choices for your outdoor photo hunting trips. However, be aware that each of them has each own unique advantages, and one may be more suitable for you than the other. Below, we’ll take an in-depth look at both Olympus TG-4 and Fujifilm XP90. Olympus TG-4 comes from the Olympus Tough camera series, which distinctively features an ultra-rugged construction with environmental sealing to allow heavy-duty usage under any kind of weather and climate. Available in red and black color variants, Olympus TG-4 is waterproof to depths of 50 feet maximum, freeze-proof to 14 degrees Fahrenheit, shockproof to drops from up to 7 feet, and crushproof to weights up to 220 lb. Besides having a very durable body, Olympus TG-4 also boasts superior output quality. It is powered by a 16MP 1/2.3” CMOS image sensor with built-in image stabilization and RAW support. It supports video recording with a maximum quality of 1080p Full HD. Furthermore, it is also quite feature-packed. Olympus TG-4 features manual exposure control and AE Bracketing, also Focus Bracketing and Focus Stacking. It comes with a 25-100mm F/2.0-4.9 lens with a maximum zoom of 4X. There are also built-in Wi-Fi and GPS. 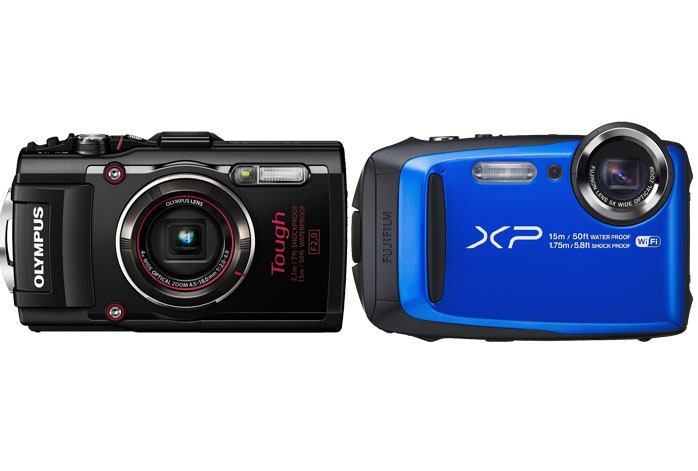 On the other hand, we have, Fujifilm XP90, which offers many similar features yet comes at a more affordable price point. For sure, Fujifilm XP90 is also powered by a 16.4 MP CMOS image sensor with built-in image stabilization and a rugged, environmentally sealed body. It even already has Wi-Fi, though without GPS, and even more powerful lens and shutter. Fujifilm XP90 comes with a 28-140mm lens and offers a 10.0-fps photo burst. The maximum magnification level is 5X. However, it has a significantly shorter battery life compared to Olympus TG-4. It can only last for up to 210 shots whereas Olympus TG-4 has a battery life of 380 shots – nearly the double. It also lacks RAW support, and is without the extensive control of manual exposure. - Waterproof to depths of 50 feet, Freeze proof to 14 degrees F, Shockproof to 7 feet, Crushproof to 220 lb. If RAW support is crucial for you, then you should go with none other than Olympus TG-4. It is also the way to go if you primarily focus on landscape and HDR photography. On the other hand, Fujifilm XP90 is viable if RAW support is not needed and you can benefit from the extra tele reach.